Sage was lucky enough to have 3 first birthday parties because each family wanted to throw her a party. So on the Sunday before her birthday Quinn's parents had a party, on the day of her birthday we had a party, and on the Saturday after my parents threw a party. Needless to say, this girl is spoiled. Rotten. 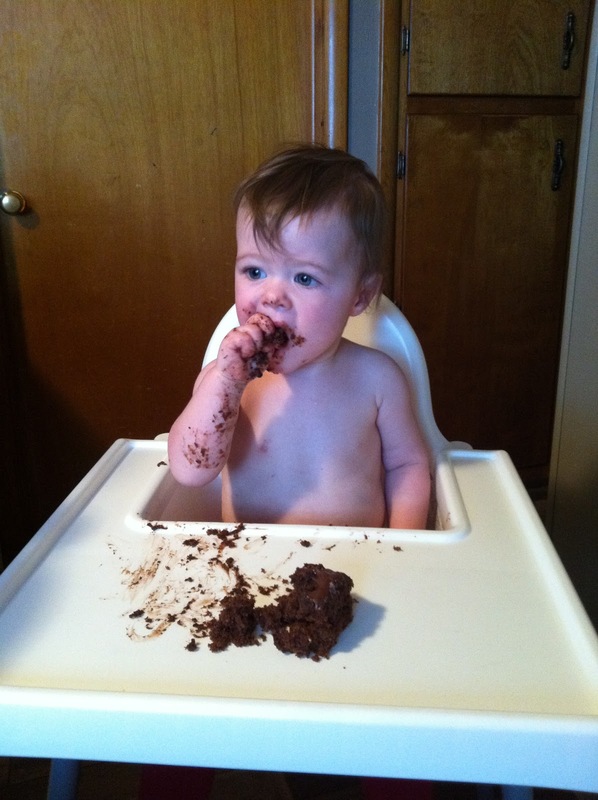 Definitely not my child..she ate hardly any cake! Sadly since we moved a week before her birthday, we had no wrapping paper..so we rednecked it. 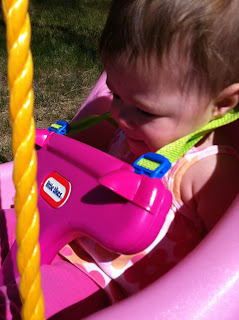 Playing in her new swing. Sage's cake my mom made. It had a daisy on top. Kids cake that my mom made. In order to get cake on her face, I had to put cake on her hands and tickle her face with a piece of grass. She ate ONE bite of this cake and was done. Where did this kid come from? The Princess with all of her birthday gifts. 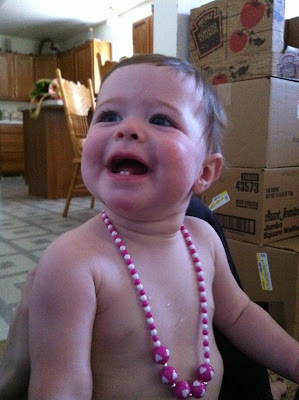 New necklace from Nana - this girl LOVES necklaces. I think I had WAY more fun this year than Sage did. I spoiled her all day and let her eat muffins for breakfast, cake for lunch, and let her do whatever she pleased for the entire day. I was determined to make sure she didn't cry once on her big day..no such luck..but it was a great day regardless. She is way to pretty. I miss her alot!!!! Happy Birthday Sage.